All our bags are packed and ready to go down South. 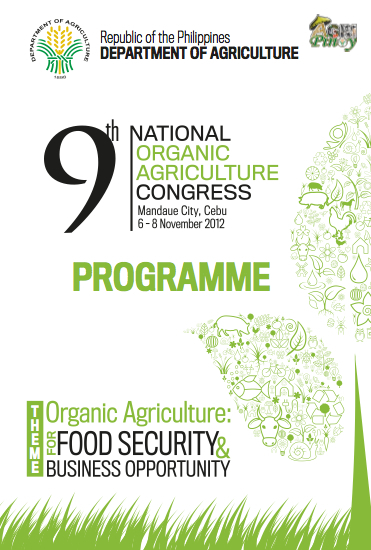 This year’s National Organic Agriculture Congress on November 6 to 8 will be held in Cebu, one of the emerging organic farming centers in the country. Assistant Secretary Salvador Salacup of the Department of Agriculture (DA) said that about 1,500 participants from the different sectors are expected to join. International Federation of Organic Agriculture Movement (IFOAM) President Andre Leu will serve as keynote speaker and will be discussing the trends in the global market for organic agriculture. Theme for this year is, “ORGANIC AGRICULTURE: For Food Security & Business Opportunity.” Topics on standards, food safety, and organic practices will be discussed. Do you think Cebu is ready to go organic?